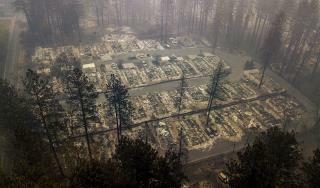 (Newser) – Investigators still haven't settled on the cause of the California wildfire that has killed more than 80 people so far, but another lawsuit is pinning the blame squarely on the utility Pacific Gas & Electric. The AP reports that Neva Rodrigues, whose 73-year-old father was killed in the fire, has sued the utility for negligence. At least two other lawsuits have been filed against PG&E by people who lost their homes. The suits hinge on a fact that could prove to be financially catastrophic to the utility: PG&E reported an outage on a transmission line in the same area and around the same time as the fire began. So what was the electric issue they reported? downed lines? surge? Put them out of business, I'm sure someone else will be glad to step up and take their place as long as immunity from similar future claims are given. As for current service, start burning wood and lamp oil.